Founded in 1997, the Saravasti Quartet celebrates its 20th Anniversary with a special four concert cycle at the “Víctor Villegas” Auditorium in Murcia. A highlight of this series is the performance of Arnold Schönberg’s Concerto for String Quartet and orchestra with the Murcia Symphony, conducted by Music Director Virginia Martínez. Music critics have written about the Saravasti: “They have accomplished technique and a first rate musical sense… The full-house audience was enthusiastic, and the quartet offered works by Haydn and Mozart as good as any other famous foreign quartet may have presented” (Tomás Marco in El Mundo newspaper, March 20th, 2007). The Saravasti Quartet (Gabriel Lauret and Diego Sanz, violins, Pedro Sanz, viola and Enrique Vidal, cello) has coached with members of some of the best string quartets of our time (Tokyo, Borodin, Kopelman and Enesco) such as Kikuei Ikeda, Clive Greensmith, Mikhail Kopelman, Ruben Aharonian, Liviu Stanese and Igor Sulyga. It was selected by the INJUVE and by the Society of Artists, Musicians and Performers of Spain to offer two concert tours. In 2012 the quartet obtained the Pro-músico Award. It has offered concerts and cycles, among other institutions, for the Museums of Prado (Meninas Hall), Reina Sofia in Madrid or Toledo Sephardic; Palau of Music in Valencia; Victor Villegas Auditorium of Murcia; Foundations Juan March in Madrid, Cajasol in Seville, CajaNavarra of Pamplona, CajaVital in Vitoria or Cajamurcia; Theaters Calderon in Valladolid or Romea in Murcia; Lugo Philharmonic Society; or the Universities of Seville, Granada, Murcia and Cartagena. Outside of Spain it should be noted his performances for the Cervantes Institute in Tokyo (on the occasion of official events for the inauguration of this headquarters), New York City and Tunisia, as well as performances in Lisbon and Paris to the Embassy of Spain in Portugal and France. The Saravasti is resident quartet of the Victor Villegas Auditorium of Murcia. Its commitment to the current composers has led him to premiere works by Manuel Seco de Arpe, Benito Lauret, Miguel Franco, Antonio Narejos, José Zárate, Salvador Martínez, Mario Medina and José Nieto. In addition to recordings for radio and television, has edited three compact discs: Music for Minotaur for RTVE-Música, Saravasti performs Mozart for the Ibersonic label and the published by the General Archive of Murcia, which includes in world premiere the String Quartets nº2 and nº4 of Mario Medina. Born in Cartagena (Spain), he obtained the Superior Titles of Violin and Chamber Music in the Superior Conservatories of Murcia and Alicante. 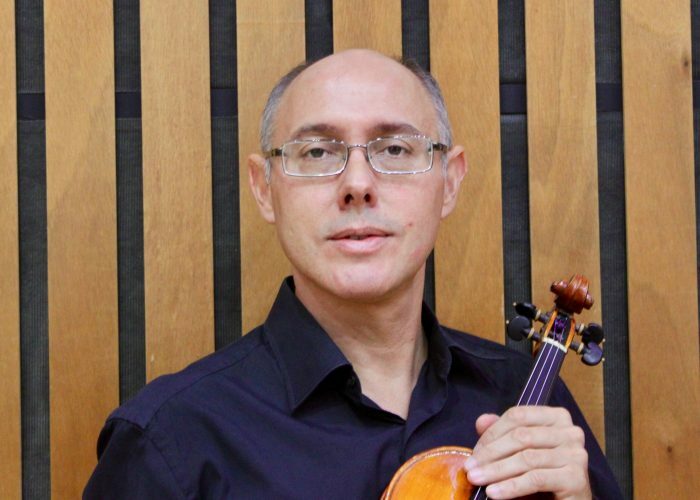 He has received lessons and master classes with artists such as Agustín León Ara, Gerard Claret, Thanos Adamopoulos, Víctor Martín, Víctor Pikaizen, Christos Polyzoides, Kikuei Ikeda (Tokio String Quartet), Mikhail Kopelman (Borodin and Tokyo String Quartets), Clive Greensmith (Tokio String Quartet), Liviu Stanese (Enesco and Vía Nova Quartets), Igor Sulyga (Moscow Quartet), and Judith Kiss Domonkos (Budapest Trio). In 1989 he received a scholarship from the Spanish Ministry of Culture and the Region of Murcia to study with professor León Ara at the Royal Brussels Conservatory (Belgium), where he received the “Premier Prix” in Violin, and in Chamber Music with André Siwy and Philippe Terseleer. 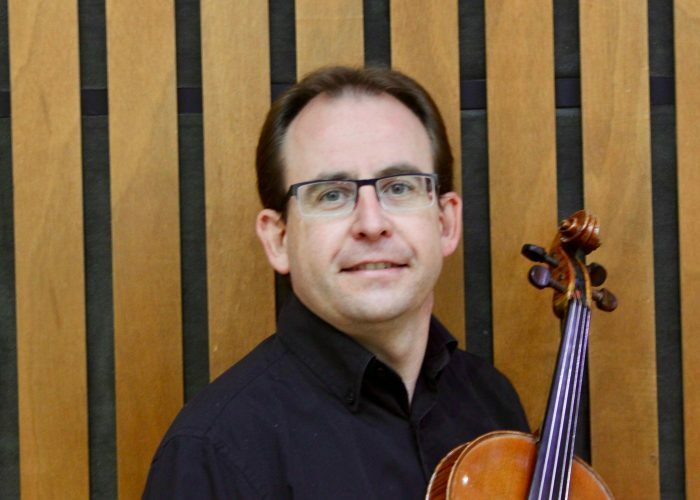 He has been a member of the Murcia Youth Orchestra as concertmaster and soloist, the Spanish National Youth Orchestra (JONDE), the Murcia Region Orchestra, and the Murcia Symphony Orchestra. From 1995 to 1999 he was conductor of the Preparatory Division of the Murcia Youth Orchestra, and he was concertmaster-conductor of the Murcia Chamber Orchestra. He has concertized throughout Spain and Europe with pianist Miguel Ángel Rodríguez. Master of Music Research by the Murcia University. He is Professor of Chamber Music at the Murcia Superior Conservatory. Born in Murcia (Spain), he studied at the Superior Conservatories of Murcia and Alicante, where he obtained the Superior Title of Violin and Special Prize of Graduation, working with M.Marseglia. He also obtained the Superior Title of Chamber Music. 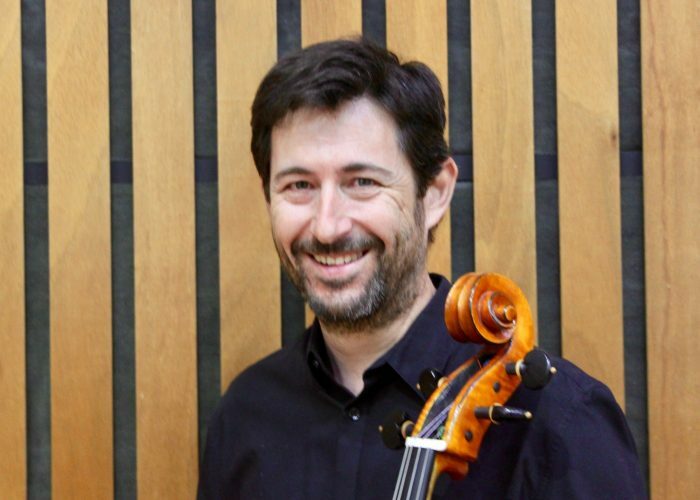 He has attended lessons and master classes in Spain, France and Austria with artists such as Kikuei Ikeda (Tokyo String Quartet), Clive Greensmith (Tokyo String Quartet), Mikhail Kopelman (Borodin String Quartet, Tokyo String Quartet, Kopelman Quartet), Ruben Aharonian (Borodin String Quartet), Liviu Stanese (Enesco String Quartet, Vía Nova Quartet of Paris), John Harding (Orlando Quartet), Jaap Schröder (Smithson Quartet), Igor Sulyga (Moscow Quartet, Kopelman Quartet), Alan Kovacs (La Plata University String Quartet), Judith Kiss Domonkos (Budapest Trio), Brno String Quartet, Dolezal String Quartet, Víctor Martín, Pedro León, Christos Polyzoides, or Demetrius Polyzoides, among others. He has been a member of the Murcia Region Orchestra, the Murcia Chamber Orchestra and the Murcia Symphony Orchestra. In 2000, he was the only candidate selected in the official examinations of the Xunta of Galicia (Spain), obtaining a Professorship of Violin in the Vigo Superior Conservatory. In 2008 he teached master-classes of Chamber Music at the “Joseph Haydn” Superior Conservatory of Eisenstadt (Austria) by the Erasmus program. 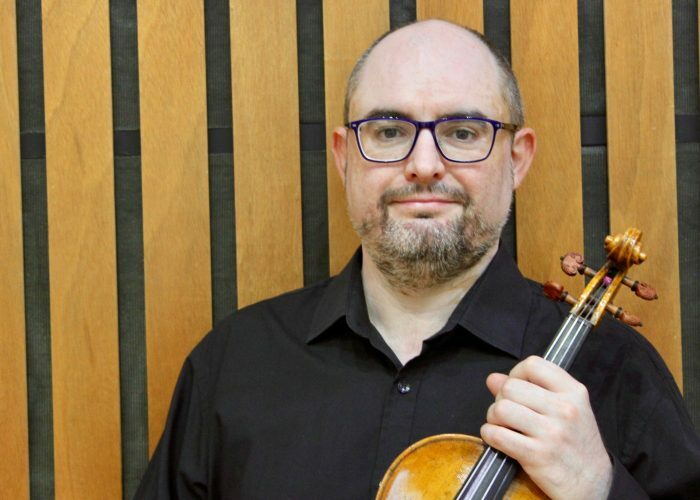 At present, he is Professor of Chamber Music at the Murcia Superior Conservatory, besides founder violinist of Saravasti String Quartet since 1996. Born in Murcia (Spain), he studied at the Superior Conservatories of Murcia and Alicante with M.Marseglia, O.de Juan and M.Baro. He obtained the Superior Titles of Viola, Violin and Chamber Music. He has played with the conductors J.Harder, I.Yepes, J.Belda, J.M.Rodilla, M.Valdivieso, B.Lauret, P.Davin, J.Pons or C.Badea in ensembles such as the Murcia Youth Orchestra, of which he was concertmaster for three seasons, the Murcia Chamber Orchestra, the Murcia Symphony Orchestra, and the Spanish National Youth Orchestra (JONDE). He toured Germany, Holland, Belgium, Italy and Spain. He has participated in master classes teached by Aldo Ceccato, orchestral technique classes with Víctor Martín and John Harding (Orlando Quartet), as well as in classes and master classes in Spain, France, and Austria, with artists such as Laura Klugherz, Gertrude Rossbacher, Alan Kovacs, Álvaro Arrans, K.Steeb, Christian Euler, Christos Polyzoides, Demetrius Polyzoides, Elizabeth Polyzoides-Baich, Kikuei Ikeda (Tokyo String Quartet), Clive Greensmith (Tokio String Quartet), Mikhail Kopelman (Borodin and Tokyo String Quartets), Liviu Stanese (Enesco and Vía Nova Quartets), Igor Sulyga (Moscow Quartet), Judith Kiss Domonkos (Budapest Trio), and the Dolezal String Quartet. He obtained a Degree in Art History and Master of Music Research by the Murcia University. At present, is Professor of Chamber Music at the Murcia Superior Conservatory besides violist of Saravasti String Quartet since 1996. Born in Pinoso (Alicante, Spain). He obtained the Superior Titles of Violoncello and Chamber Music at the Superior Conservatories of Murcia and Alicante with the highest marks. edo, Demetri Motatu, Francisco Pastor, Mark Friedhoff, Konrad Haessler, Boris Baraz, Bárbara Macinkovska, Clive Greensmith (Tokio String Quartet), Kikuei Ikeda (Tokyo String Quartet), Mikhail Kopelman (Borodin and Tokyo String Quartets), Liviu Stanese (Enesco and Vía Nova Quartets), Igor Sulyga (Moscow Quartet), and the Brno String Quartet, and Dolezal String Quartet. For eight years he was a member of the Murcia Youth Orchestra, being principal cellist for the last three seasons, as well as soloist. He toured Spain, Germany, Holland and Italy. He also was a member of the Murcia Region Orchestra, the Murcia Symphony Orchestra, and principal cellist of the Murcia Chamber Orchestra. He is Professor of Violoncello and Chamber Music at the Alicante Conservatory, besides founder cellist of Saravasti String Quartet since 1996.